Oh boy, are the offseason rumors swirling. No one knows the future of New England Patriots tight end Rob Gronkowski, and it sort of feels like he doesn’t know either. In the aftermath of the Patriots’ Super Bowl LII loss to the Philadelphia Eagles, the 28-year-old would not comment on the hearsay that he is considering retirement. But what would he do next? We’ve first heard that acting was on his agenda, but now it is being said that he could be entering the wrestling ring. 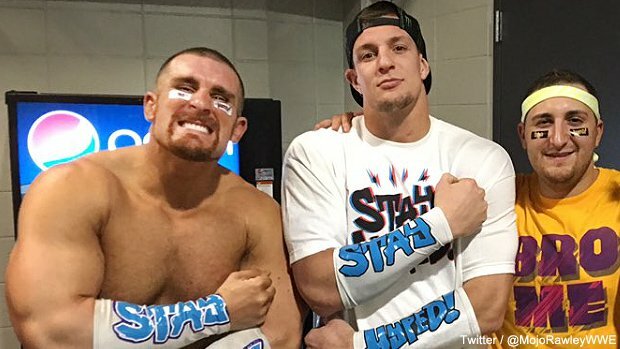 Gronk joined Rawley at Wrestlemania last April, so it would be easy to picture him with a future in WWE; but Patriots’ fans, players and staff members probably prefer that he be catching passes from TB12 in the fall.